This is not yoga by the body for the body, but yoga by the body for the mind, for the intelligence. The intelligence we are now developing depends upon emotional and moral maturity, the ability to value truth and respect ethical conduct, the capacity to feel love in its more universal sense as compassion. The role of awareness is to fill the gaps that inevitably exist between the physical and organic sheaths of our bodies when we practice yoga. The power we generate through yoga practice must become a coherent and indissoluble whole. Energy and awareness act as friends. Where one goes, the other follows. It is by the will of awareness to penetrate that intelligence, is able to move into and occupy the darkest inner recesses of our being. We say intelligence has insight. We should complement that by saying that soul has ‘outsight’; it is a beacon shining out. Considerable achievements also bring in their wake considerable dangers. An obvious one is pride–not satisfaction in a job well done, but a sense of superiority and difference, of distinction and eminence. Yoga is an interior penetration leading to integration of being, senses, breath, mind, intelligence, consciousness, and Self. It is definitely an inward journey, evolution through involution, towards the Soul, which in turn desires to emerge and embrace you in its glory. The pursuit of pleasure through appearances, which I connect here to superficiality of intent, is quite simply the wrong way to go about things. To pursue pleasure is to pursue pain in equal measure. When appearance is more important to us than content we can be sure we have taken the wrong turning. High intelligence brings the gift of power, and we all know that power corrupts. When intelligence is corrupted it brings woe upon ourselves and upon the world. If we live outwardly virtuous lives, it is easy to convince ourselves that there is nothing else wrong with us. Often this is the besetting sin of the puritan or religious fanatic. We often both suppress the truth and suggest the false. Ego aids and abets all flaws of intelligence. Conscience hurts, it causes us pain. We say we are pricked by conscience. … That is because it lies of the paradox of what it means to be a spiritual being living in a physical body in a material world. Paying attention in yogic terms is not concentration. True concentration is an unbroken thread of awareness. In a perfect asana, performed meditatively and with a sustained current of concentration, the self assumes its perfect form, its integrity being beyond reproach. 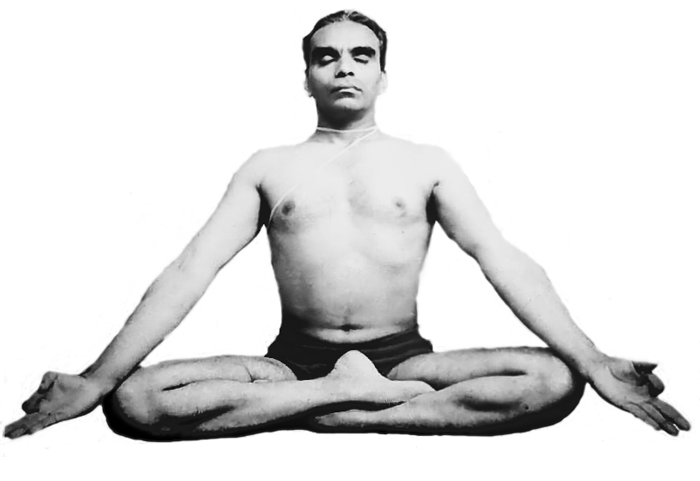 This is asana performed at the sattvic level, where luminosity infuses the whole pose. I am practising asana but at a level where the quality is meditative. The totality of being, from core to skin, is experienced. Mind is unruffled, intelligence is awake in heart rather than in head, self is quiescent, and conscious life is in every cell of the body. That is what I mean when I say asana opens up the whole spectrum of yoga’s possibilities. I have often said that yoga is meditation, and meditation is yoga. Meditation is the stilling of the movements of consciousness. It is bringing the turbulent sea to a state of flat calm. This calm is not torpid or inert. It is a deep tranquillity, pregnant with all the potential of creation. The yogi is journeying from the world of things and events, which are so joyful, painful, baffling, and unending, back to the point of stillness before the waves were ruffled. Do not confuse aloneness with loneliness. Loneliness is separation from the cosmos. Aloneness is to become the common denominator of the cosmic all. Is this the end? Are we there yet? No. There remains the ego, the self, the known self, the impersonator of the soul. He is the last actor to leave the stage. He lingers even for the very final handclap of applause. What forces him off the stage? Silence and retention of the breath. Just as the cessation of the movement of thought brings purity to intelligence, so a motiveless retention effaces ego. What the practitioner eventually experiences is not that at some point he suspends the breath. He is no longer the subject, the agent. The breath breathes him. What this means is that at the highest level of meditation the cosmos breathes you. The unpremeditated retention of breath after exhalation opens the gap in the curtain of time. No past, no future, no sense of passing present. Only presence. The end of duality that comes from meditation is the end of separation and the end of all conflict. The yogi stands one and alone. Do you have a story of healing or transformation through yoga that you’d like to share with the world? We believe that now, more than ever, the world needs to hear about the healing power of yoga. The Yoga Diaries is now accepting submissions. We invite you to submit your story. Please help us to spread the word…and the light.